Termites feed upon materials that contain cellulose, such as wood. Many species of termites cannot digest cellulose to extract the sugar content, so they rely on protozoa in their gut to do the job. They can do this because of a mutually beneficial association with the micro-organisms in their digestive tracts that convert cellulose into simple substances that termites can digest. In nature, termites are very beneficial insects because they return dead trees to the soil as nutrients. Termites help convert dead wood and other materials containing cellulose into humus. Unfortunately, termites do not distinguish between wood in a structure and wood in a dead tree in the forest. 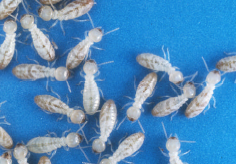 Termites are considered to be pests when they attack structures built and inhabited by humans. Subterranean termites are one of the most potentially damaging insect pests of structures in the U.S.
Entomologists have described about 2,200 species of termites for the entire world; however, only 70 of these species infest structures and require control. There are 13 species of termites in the continental United States that require man’s attention to a greater or lesser extent. Termites occur in every state of the United States and parts of Canada. Subterranean termites are the most common type of termites found in the United States. To date, they have not been reported in Alaska. They cause varying degrees of trouble, depending on the geographical location. The presence and abundance of termites in an area is determined by several factors, including temperature, humidity, soil type and soil moisture. Because subterranean termites rely on soil moisture, they are affected by soil types. In clay soils, moisture is not as readily available because it is tightly bound to the soil particles. Sandy soils have more available moisture. Consequently, subterranean termites are generally more prevalent and more able to survive in sandy soils. Fungi in wood are another source of moisture. 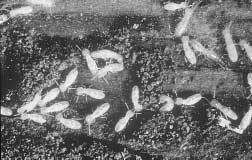 Many people confuse the winged primary reproductive termite with flying ants, which can also be found swarming near structures. Termites can be distinguished from ants by comparing their physical characteristics. 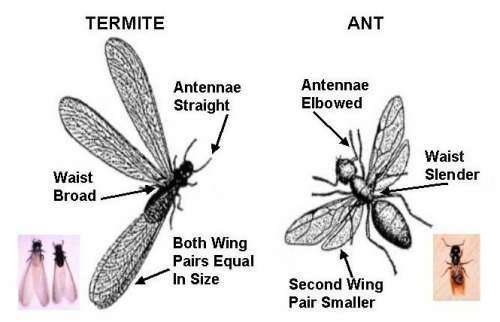 It is very important to recognize the differences between termite swarmers and ant swarmers. Winged termites are often mistaken for winged (alate) ants because they have a somewhat similar appearance. However, these insects can be readily distinguished from each other by differences in their antennae, body shape and wings.